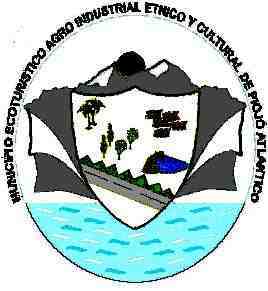 Piojó is a municipality in Department of Atlantico, Colombia. It was founded on 15 March 1533. The flag of Piojó is horizontal white over green and charged with "palma amarga" (Sabal mauritiiformis). "[The flag] was designed by teacher Manuel Utria. 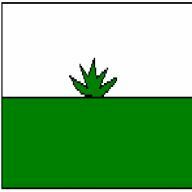 Its colours are green and white and it includes the symbol of the "amarga" palm. Green means hope and the spirit of our lands. White means peace. The palm is grown as a monoculture in the municipality." Sabal mauritiiformis (H. Karst.) Griseb. & H. Wendl. is known in English as Bay palmetto, Green botan, or Savannah palm. There are several other species in the Sabal genus, for instance Sabal palmetto (Walter) Lodd. ex Schult. & Schult. f., the cabbage palm. The Savannah palm is native from Central America and Northern South America, like all the other Sabal palms. These species are used locally in the roofing of homes, as food (fruits and buds) and to produce hats, brooms and handicrafts. See Perez, M., Rebollar, S., 2003. Anatomía y usos de las hojas maduras de tres especies de Sabal (Arecaceae) de la Península de Yucatàn, México. Revista de biología tropical, 51 : 333-344.